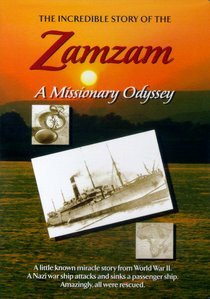 Eyewitness accounts of a gripping, true story of faith, hope and adventure on the high seas from World War II. An old Egyptian passenger liner carried 144 missionaries from 20 denominations bound for mission work in Africa. The Nazi warship Tamesis mistakenly identified it as an enemy ship and shelled and sunk it off the coast of South Africa. All of the passengers abandoned ship, and their precarious plight was filmed by two photographers who just happened to be on board - missionary V. Eugene Johnson and Life Magazine photographer David Scherman. Here are their amazing pictures along with the firsthand stories of those who lived through the ordeal. All the missionaries were rescued. Were they miraculously delivered? See their story and decide for yourself. -Excerpts from a missionary's journal in PDF format. About "The Incredible Story of the Zam Zam"